Kate Roberts, Head of Policy at Kalayaan, analyses the disastrous effects of tying the Overseas Domestic Workers’ visa to employers has on domestic workers coming to work in Britain. Lara was brought to Kalayaan by another Filipina lady who had met her on the London street in tears. She appeared to be distant, as if in shock. When she explained her story the reasons for this became clear. She came to the UK with the family she had been working for as a domestic worker in the Middle East for 15 years. The conditions she described during this time are difficult to imagine. She had no time off at all and slept on the floor of the children’s room. Her day would often continue until 4am as she was expected to serve a large family, cook and keep the house spotless. During the day she was driven to other houses to clean and she would finish the work in the house she lived in during the night. The children would have her up at 7am. She never left the house alone and would have to ask the driver to buy anything she needed, including sanitary items. She described only being shouted at and having plates and other objects thrown at her for any perceived mistake. For this she was paid £33 a week. I asked why she had never left before. 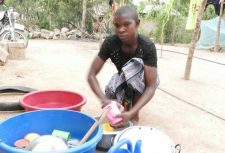 Lara explained that she was a single mother and working overseas as a domestic worker was the only way she can provide for her children. Like so many domestic workers who we meet at Kalayaan Lara had decided that she would sacrifice her life in the hope that her children would not have to do the same. This was her second visit accompanying her employer to the UK, she ran away this time because she found her passport, which was always kept from her, and managed to steal it back. In spite of having no money and knowing no one this had given her enough hope to escape. I looked at Lara’s passport. She had entered the UK on the Overseas Domestic Worker visa. Because she had entered after 6 April 2012 her visa had her employer’s name written on it. It was valid for 6 months and could not be renewed. I explained this to Lara and also that in my view she had been kept in Modern Slavery and trafficked to the UK for domestic servitude. I explained to her that at Kalayaan we can make referrals into the Government’s system for identifying victims of trafficking and what this would mean for her including access to legal aid. But it wouldn’t allow her to work. . Lara appeared to find this information difficult to process, explaining that she needs to work to provide for her children. I had to explain that now she had left her abusive employer she is not able to work for anyone else in the UK. We talked about voluntary return to the Philippines but again this was something Lara didn’t want because of the need to financially provide for her children. We agreed to speak again shortly. The next time I called Lara she handed the phone to her friend who explained that Lara’s son in the Philippines had a serious accident. They were trying to raise money in the local community to pay the hospital bills. She explained that supporting Lara was like having an ‘adopted child’, that Lara couldn’t function normally or make decisions after all these years of being controlled. I suggested a trafficking referral again. Again they explained to me Lara could not see how this would help her, her family needed her to work. Again I had to explain that this is not something she could legally do in the UK. The subsequent times I phoned Lara would not pick up. There was nothing else we could do. Lara’s story shows exactly what domestic workers in Britain are facing if they want to escape abuse. Our fears are that workers like Lara who are psychologically damaged from their prolonged trafficking experiences are being driven underground to face further abuse. In the 9 November edition of the London Standard a report quoting Kevin Hyland, the UK’s Anti-Slavery Commissioner, suggested that the government was considering introducing a system of spot checks on employers of domestic staff to combat modern slavery. Any additional measures to support migrant domestic workers to access their rights and to escape abuse would be welcomed. It is unacceptable that in the UK 74% of workers on tied Overseas Domestic Worker visas who come to Kalayaan report that their passport is kept from them and 81% report having no time off at all. Both of these are indicators of modern slavery. But there was no mention in the article of the importance of having basic rights, including the ability to change employer, in place before any such spot checks can be effective. Many domestic workers we see at Kalayaan have been taught by their employers to be scared of the police. They know that their employer’s name is written on their visa and that even though they are paid a few pounds a week it is the only option to send any money home. In our experience, if domestic workers are encountered by police or other inspectors with whom they are unfamiliar and if they do not know if they will be protected in the UK then it is highly unlikely that they will disclose abuse. We have seen workers escape abuse and come to us for help yet return to conditions of slavery when they realise that the UK will only eventually return them to their country of origin along with the debts they incurred to migrate initially. Before April 2012 domestic workers had the right to change employers, to another full time job as a domestic worker in a private household. This was not challenge free; levels of abuse were still high, and domestic workers had no recourse to public funds so would be destitute upon escaping abuse, but many were able to move on, into decent employment, were they paid tax, were protected by employment law and contributed to the UK economy as well as supporting their families. The changes which tied domestic workers to their employers seem to be a response to fears around levels of migration to the UK, yet, according to the Government’s figures, migrant domestic workers never contributed to more than 0.5% of UK net migration. The option to change employers and stay in the UK appears to have been used by a minority of workers but to these workers it provided a vital life line. There is also evidence that the fact domestic workers could leave their employer did much to improve their negotiating status with employers and to prevent abuse. For example while 74% of workers who were tied to their employer reported to us that their passports were kept from them, a still unacceptable but significantly lower 50% of those who were not tied reported the same. Others, from the Centre for Social Justice, to Andrew Boff, leader of the Greater London Authority Conservatives, to all human rights organisations working on the issue agreed. Although the original domestic worker visa with its corresponding rights did much to prevent abuse, the consensus was that more needed to be done. Instead we are in a situation where in spite of having enacted a Modern Slavery Act, domestic workers are still tied to their employers. History and common sense makes clear that when workers have options and are protected by law they are treated better. Those who are exploited are more likely to go to the authorities for help if they have rights. If their immigration status is insecure many will make the desperate decision to accept appalling treatment in order to send some remittances to their children. History also shows clearly that until 2012, when Overseas Domestic Workers could change employer and, if in employment, apply to renew their visa, there was less abuse. Reinstating the pre-2012 rules would bring immediate benefit both to the workers themselves and to the British economy. Only once we get these basic rights in place we can work to support domestic workers to speak out, start disclosing abuse, and take action against those criminally exploiting them. Until then, measures such as spot checks will not help to plug the hole made by the tied ODW visa in the Modern Slavery Act. Kalayaan is a London based organisation providing support to migrant domestic workers. You can find out more at www.kalayaan.org.uk and follow them on twitter: @kalayaan.